Movie Ramble: Mysteries of Lisbon. ‘It is not a work of fiction, it’s a diary of suffering’ announces the introductory quotation of Chilean director Raul Ruiz penultimate feature film. 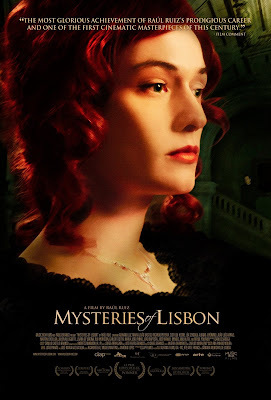 Ruiz is not a director I am familiar with and apparently very few of his 100 or so films have been released in the UK, which seems a great shame after watching his epic 266-minute period drama Mysteries of Lisbon (2010). Originally intended as a six hour TV mini series but subsequently tailored for the big screen. I’m not going to try and explain the plot only to say that the story, adapted from a 19-century novel written by Camilo Castelo Branco and never translated into English, has many differing strands covering three generations over a fifty-year period. It presents its narrative like a family tree where the films characters are in some way connected with each other, with an orphan and a priest at the centre of its branches. Nothing is what it seems; every one changes their names and identities, which does tend to complicate matters for the viewer. Truly a jigsaw puzzle of a film, a dream like experience that needs patience to untangle its complex web of intrigue! But saying that it is worth it. This beautiful production has a fabulous cast with some wonderful scenery and settings and some elegant camera work from Andre Szankowski. It does bring to mind another Portuguese film; Rita Azevedo Gomes artistic treat A Woman's Revenge (2011) that unfortunately still does not have a general release in the UK. Raul Ruiz died in August 2011 at the age of 70.